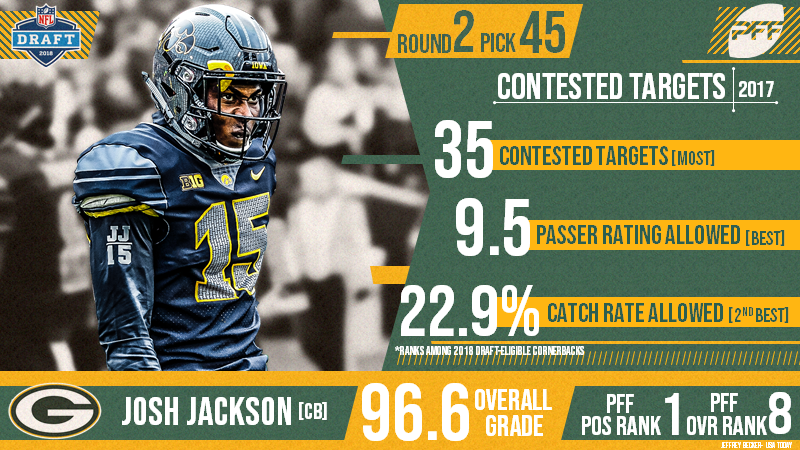 With the 45th selection of the 2018 NFL Draft, the Green Bay Packers have selected Josh Jackson. The former Iowa standout cornerback was selected 45th overall after finishing the 2017 season with an 96.6 overall grade. Jackson’s grade in 2017 was more than 4.0 points higher than the next closest, and the highest grade ever given to a CB in the PFF college era. Allowed 40 receptions from 91 targets (44.0 percent), surrendering only 432 yards from the second-highest target volume in the draft class. Allowed a passer rating of just 36.5 when targeted this season from 91 passes, the fifth-best mark in the class and best with that volume o ftargets.